We want your college student to be successful throughout their career at Georgia Southern University. They need a good foundation and support to gain this success. At Lakeview at Market District, we want to help support their productivity by giving them a fully equipped computer lab at their fingertips. We want to keep them healthy with an on-site state-of-the-art fitness center. Lakeview at Market District meets every need that your student will have while in college so they can achieve what they came here for in an enjoyable atmosphere. Individual leasing means peace of mind for you. Your financial responsibility is only for your student’s space unlike many apartments or rental houses where a joint lease is signed. If a roommate transfers to another school or moves out of Lakeview at Market District for any reason, you do not have to worry about having to cover their portion of rent. 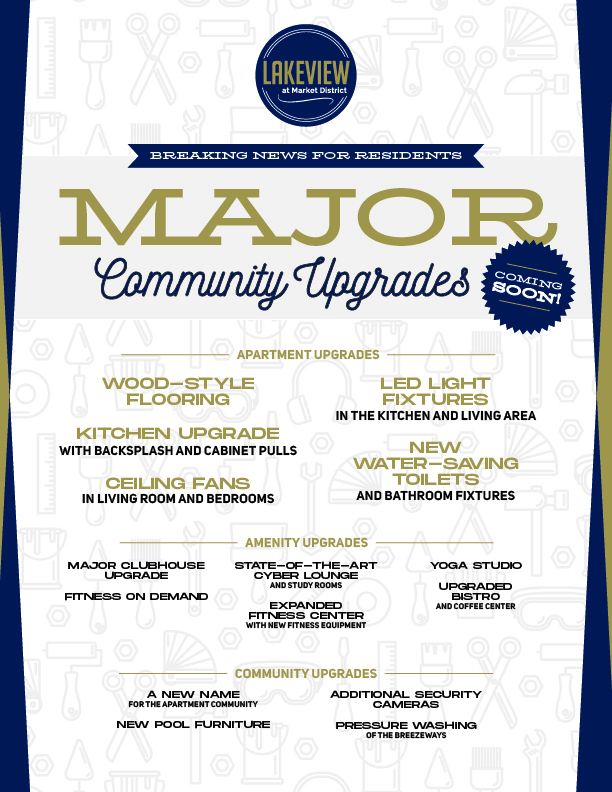 This is just another reason why Lakeview at Market District is your student’s best housing option! Our maintenance staff will respond to your student’s maintenance issues quickly and professionally. Lakeview at Market District offers 24-hour emergency maintenance as well so that your student’s comfort is not affected. Lakeview at Market District has three spacious floor plan options so they will easily be able to find one to suit their needs. We have two-bedroom, and three-bedroom apartment homes. They each have their own bedroom and bathroom. Lakeview at Market District is a fully-furnished community, saving you money! Each student will have a full-sized bed, and end table. The living area comes with a comfortable couch, chair, coffee table, end table, TV stand. The kitchen comes fully equipped with energy efficient appliances, a refrigerator with icemaker, dishwasher, and washer & dryer. While the main focus of your student’s college career will be about graduating and getting a fulfilling job, they also need to have fun along the way. At Lakeview at Market District, your student will create life-long relationships and connections that will make them even more successful. Our great staff plans monthly resident events to get them involved. These events range from pizza parties to karaoke nights, from resume building classes to gaming tournaments. We will also keep our residents connected to events going on at Georgia Southern University, as well as events happening around town so they don’t miss anything! We want your student to succeed, and that’s why we thought of them while designing Lakeview at Market District as a Living-Learning environment! Lakeview at Market District rent includes: utilities (water, sewer, and trash pickup), extended cable, Internet, washer & dryer, access to all of Lakeview at Market District’s amenities, and a wonderful staff that is there to help you anytime you need them. Yes, pets are allowed at Lakeview at Market District. Lakeview at Market District’s insurance will not cover your personal belongings. We suggest getting renter’s insurance for this reason. It is generally inexpensive and will cover your personal belongings if something were to happen. Lakeview at Market District’s lease is binding and cannot be broken. If you cannot live at Lakeview at Market District after signing your lease, you will need to re-let. Please call the leasing office for information on re-letting. Lakeview at Market District is fully furnished with a full-sized bed, large desk and chair, and dresser. The living area comes with a comfortable couch, chair, coffee table, and end table. The kitchen comes fully equipped with energy efficient appliances, a refrigerator with icemaker, dishwasher, and washer & dryer. Your mail will be delivered to your apartment’s mailbox located on Lakeview at Market District property. What kinds of events do you have at Lakeview at Market District? Lakeview at Market District has resident events that range from pizza parties to Taco Tuesdays. Not only is there free food at events, but it’s also a great way to meet people!